Zac Purton celebrates after winning the Hong Kong Cup aboard Time Warp. The Longines Hong Kong International Races are the richest horse races run in Hong Kong, and is the last major race day for Thoroughbred flat racing anywhere in the world. 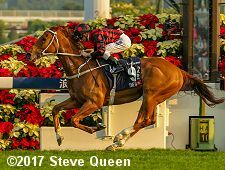 Billed as the "Turf World Championships", four Group 1 races were contested on Sunday afternoon over the right-handed 1 3/16 mile turf course at Sha Tin Racecourse. 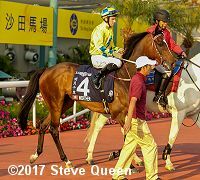 Conditions were typical for December in this subtropical city, with a good turf course, sunny skies, and temperatures in the low 70's, with 94,560 fans in attendance, setting a new handle record of HK$1.6 billion (US$205 million). Hong Kong Jockey Club CEO Winfried Englebrecht-Bresges said, "We want the Longines Hong Kong International Races to be the greatest show on turf and today we witnessed some sensational performances. I think we are at a very high level, we have a very attractive global product, but we know that resting on laurels never works and we will sit down and see how we can develop this meeting going forward – we think this meeting has further potential as one of the sport's great world events. 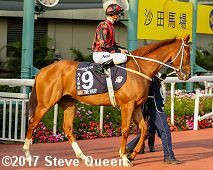 The depth of quality in this year's races has shown again that Hong Kong is able to attract world-class horses, and in particular it was probably the best Hong Kong Vase we have ever had." 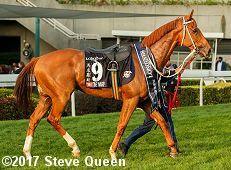 In the main event, a field of 12 older horses contested the HK$25 million (US$3.2 million) Longines Hong Kong Cup (G1) at 2000 meters (about 1 1/4 miles) on the turf. Werther was sent off as the 6-5 favorite off his win in the Jockey Club Cup (G1), the main local prep for this event, after winning the Champions and Chater Cup (G1) and Hong Kong Gold Cup (G1) earlier in the year. In to challenge him included 3-1 second choice Time Warp, runner-up in the Jockey Club Cup (G1), and 6-1 third choice Neorealism, winner of the Audemars Piguet QEII Cup (G1) here in April but 13th in the Tenno Sho Autumn (G1) last out at Tokyo. The start of the Hong Kong Cup. Jockey Zac Purton sent Time Warp to the front first time by and he set easy fractions of 26.27, 51.39, 1:15.76, and 1:39.55 over the good course while pressed by 27-1 Smart Layer and stalked by Neorealism. Turning for home, Purton asked Time Warp to open up on the field and he obliged, gaining a 2 length advantage midstretch. Werther, 7th early under Tommy Berry, put in a late rally but was left with too much ground to make up as Time Warp cruised to win by 2 1/4 lengths gate-to-wire in 2:01.63. It was another 1 1/2 lengths back to Neorealism third. 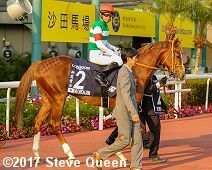 Left: Time Warp in the winner's circle after the Hong Kong Cup. Winning trainer Tony Cruz said, "I told Zac to stay cool, ride the way I want this horse to be ridden. Zac did exactly what I wanted him to do. He just took him to the front and nobody was going to catch him. I said, ‘just wait for them to come, and when they push you, go. When they came, he just took off. As you saw with the races he won in France, he loves to go to the front," said Cruz. "Today I thought there were no speed horses and nothing was going to take us on. Even if they had done, they couldn't do him for speed." Right: Time Warp parades after the race. Cruz added, "I would love to go abroad with him. He is a very versatile type of horse: he can go on the soft; he can go on the firm; he can go on the dirt too. I am sure this horse can go places. He is a very sound horse and he is a healthy horse. I haven't done his program but I believe he can win elsewhere. " Left: Time Warp heads out to the track before the race. Winning jockey Zac Purton said, "He has got a high cruising speed and he can kick off that. When nothing attacks him, you can see how good he is. I couldn't see much speed on paper before the race so, unless anyone did anything differently, I thought I might be able to get my way in front," said Purton. "I had a very easy time and that was key to the result. Tony has a great deal of confidence in his horse and he rang me this morning specifically to talk about this one so I thought he must have been pretty keen on him." The win completes Purton's career "Grand Slam", having won all 4 of the International Races. 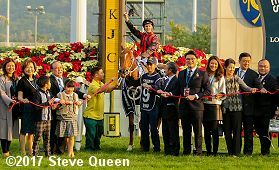 Right: All the connections and officials pose with the trophy and winner's banner after the trophy presentation for the Hong Kong Cup. Left: Second place finisher and beaten favorite Werther heads out for the post parade before the race. Trainer John Moore said, "There was no speed up front and you couldn't be where he was unfortunately. I wanted him to be ridden closer but, whatever happened, he just wasn't there in the spot I wanted. It meant he had too much ground to make up and would have had to run an impossible sectional to win. He hasn't disgraced and we can now look down the road to the Stewards' Cup, Gold Cup and perhaps Dubai." Right: Third place finisher Neorealism heads out for the post parade before the race. Jockey Joao Moreira said, "It was a fantastic run. He was a bit keen early and it took me quite a while to get him to relax but he did a very good job to finish third." 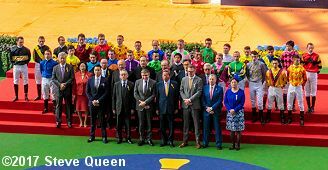 All the jockeys and officials at the opening ceremony for the Longines Hong Kong International Races. Englebrecht-Bresges added, "When we see a champion like Highland Reel coming to Hong Kong for his last race, with his trainer Aidan O'Brien and his record 28 Group 1 wins here in person, it speaks volumes for the meeting's international status. It was the second-highest attendance – only a little down on last year – and that really produced a great atmosphere. We also had record turnover – HK$82 million more than last year. That's an extremely satisfactory result. International racing brings people from across the world together for the passion and love of horse racing and this is what we see every December." 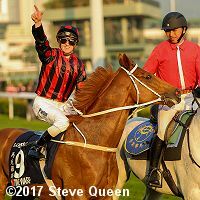 Time Warp wins the 2017 Longines Hong Kong Cup - At Sha Tin on Sunday, local hero Time Warp won the Longines Hong Kong Cup over favorite Werther with Neorealism fourth. Get the results, chart, and photos here. Highland Reel victorius in the 2017 Longines Hong Kong Vase - Favorite Highland Reel closed out his career winning the Longines Hong Kong Vase over Talismanic with Tosen Basil third. Get the results, chart, and photos here. Beauty Generation takes the 2017 Longines Hong Kong Mile Beauty Generation held off Western Express to win the Longines Hong Kong Mile with Helene Paragon third. Get the results, chart, and photos here. Mr Stunning knocks them out in the 2017 Longines Hong Kong Sprint - Favorite Mr Stunning held off D B Pin by a head to win the Longines Hong Kong Sprint with Blizzard third. Get the results, chart, and photos here.